I implore you to go through your blog archives and remove the stuff you no longer believe in, like posts promoting weight loss, certain diet trends, etc. People FIND this stuff. They think that those ideas represent your current thinking, and they get really confused. When I read this, my immediate thought was that I was safe. I started blogging from an eating disorder perspective, always being careful of my wording. “My middle name should be non-diet,” I thought. I prided myself on being able to tell you the benefits of a food without mentioning weight loss. But I decided to go back through anyhow – just in case. While I hadn’t written anything outright pro-diet, there were three ideas I saw throughout my early posts that I have since learned are problematic. For each, I can clearly see how I thought I was doing the right thing. I can also see where I was potentially doing more harm than good. Whenever I mentioned metabolism, I was careful about using “support your metabolism” over the pro-diet “speed up your metabolism”. I know that many people fear that an eating disorder has “ruined their metabolism for LIFE!” I hoped that, by writing about foods that “‘support your metabolism”, I would help lessen some anxiety around this issue. Each of us has a different metabolic rate, and that rate will change over time. It’s supposed to. While a change in metabolic rate may indicate thyroid or other problems, there’s really no problem with having a slower metabolism. Suggesting that we need to be concerned with our metabolism AT ALL is to suggest that we need to be concerned with the number on the scale. You are worthwhile, no matter how fast your metabolism is, no matter what you weigh. One of my most popular posts is entitled Why I Never EVER Cheat. I wrote it as sort of a bait-and-switch – reel them in with the title, only to talk about the problem with “cheat days”. It was meant to highlight the importance of a non-diet approach to food. I was trying to promote balance over the obsession with “clean eating”. However, when I read it through new eyes, I realized how much of the wording was problematic. I talked about how my own diet was “pretty clean”, and about avoiding chemicals, etc. I was trying to convince people that junk food wasn’t bad, while subtly shaming that same food. And, worst of all, it had some restrictive undertones. When I looked back at it, I realized it needed MASSIVE edits. I wrote it while I was still in nutrition school, and I could see how much of it was influenced by that world. The idea of clean eating is SO problematic, because it promotes a food hierarchy – the very thing I was railing against in the original post. Clean eating tells us that some foods are dirty, and that’s just as problematic an idea as junk food. 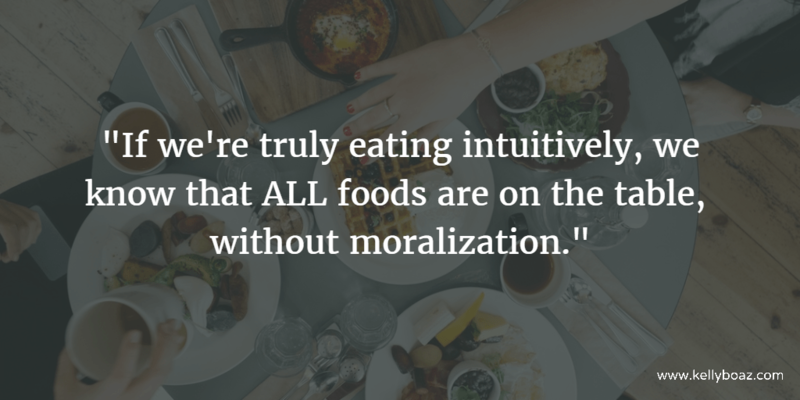 If we’re truly eating intuitively, we know that ALL foods are on the table, without moralization. While my weight has fluctuated throughout my life, I’ve never been more than what the body positive community would refer to as a medium woman. While I was considered “curvy” to the acting world in that body, the real world had no problem accepting my size. I’ve never experienced true fat shaming. I have, however, had unkind words lobbed my way about being “too skinny”. Because of that, I wrote a piece years ago talking about the problem with “skinny shaming”. In it, I talked about how hurtful it could be. I spoke about an incident where Fiona Apple left the stage in tears after being heckled for her low weight. And, I’m ashamed to say, I talked about how nobody would have said that if she was at a higher weight. I really cringe at that last part. In recent years, I’ve gotten much better at listening to stories of people who are marginalized in different ways from myself. In listening to the body positive community, I’ve had my eyes opened to just how cruel people are to those who live in “fat” bodies. I now understand that, while it’s important for everyone to love their bodies, it’s infinitely more difficult to do so if society is constantly telling you your body is wrong. (Virgie Tovar‘s writings are a great place to start, if you’re new to the body positive movement.) And while body dysmorphia is a very real thing that makes us FEEL like the world is calling us fat, those of us who live in straight-sized bodies don’t regularly experience people calling us fat to our faces. My experiences are valid, but my approach was flawed. I should have written about how to approach someone you’re concerned about. (Hint: it’s not yelling it at a concert.) I could have talked about how you can’t tell how healthy someone is by looking at them. This option would have been much more body positive. But I was too wrapped up in competitive suffering – “Skinny people have it bad, too!” I didn’t realize how problematic and hurtful that compulsion was. We are exposed to new ideas, new stories, and different perspectives every day of our lives. Often, these stories highlight our own shortcomings. We learn how we’ve been prejudiced, how we’ve committed micro-aggressions, and how we’ve hurt those around us. In the face of these realizations, we can either act defensively, or we can make a change. When we know better, we do better. We all live in a diet culture. I subscribed to many pro-diet beliefs for a large portion of my life. As a result, I will make mistakes, from time to time. Yes, even still. But I will listen to those who know better. I will apologize to those who I’ve hurt. And I will try to do better next time.